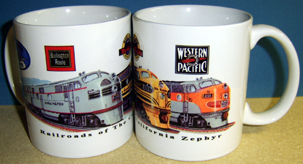 Famous for Zephyr passenger trains and owned by the NP and GN, all now part of the BNSF Railway Company. Illinois Rwy Museum in Union, IL operates the complete Nebraska Zephyr streamlined train & be sure to visit the Galesburg Museum in Galesburg, IL. Individual marks are licensed marks owned by BNSF Railway Company and are used under an active license agreement. 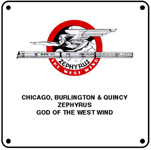 6 inch x 6 inch square tin sign of the Chicago, Burlington & Quincy Railroads Zephrus God moving a fast passenger train west with its God of the West Winds powers. 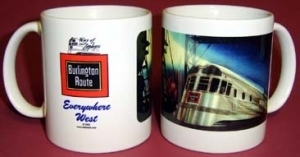 Chicago Burlington & Quincy coffee mug featuring the beautiful square Burlington Route logo superimposed over the silver fluted side image of the Burlingtons Great Silver Fleet. 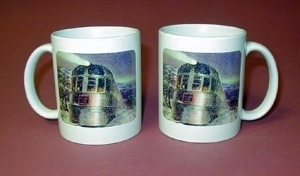 Colorful mug with the gleaming new Denver Zephyr operating between Chicago and Denver. 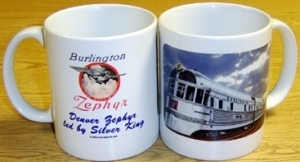 Burlington Zephyr rolling through the wintery snow taking folks home for the holidays. 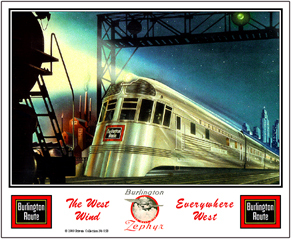 Beautiful Burlington Zephyr in a night scene. 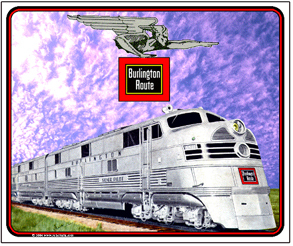 Mouse Pad featuring the Burlington Railroads Parade of Progress circa 1963 at Galesburg, IL. Mouse Pad featuring the CB&Q E Unit Silver Pilot with a beautiful evening purple sky. 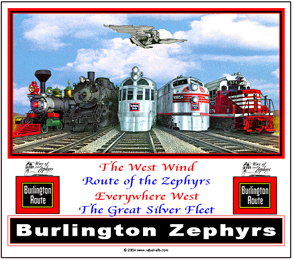 Mouse Pad featuring the Burlingtons westbound Zephyr with old west scenes in the sky. A gorgeous pad of historical significance. 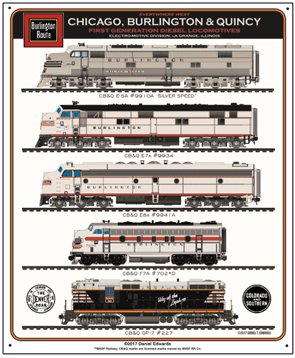 Unique sign featuring diesels used by the Chicago, Burlington & Quincy Railroad throughout the years. 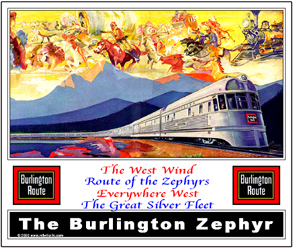 The Great Silver Fleet of the Burlington Route. 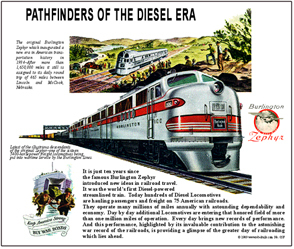 Historic ad of the Burlington Railroad receiving it new EMC FT freight diesels. 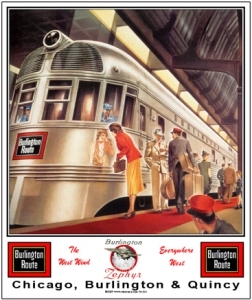 Nostalgic scene of the Burlington's Silver Pilot E-5 passenger diesel rounding a curve. 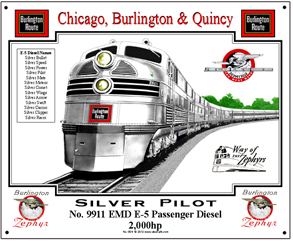 Silver Zephyr is preserved at the Illinois Railway Museum in Union Illinois. 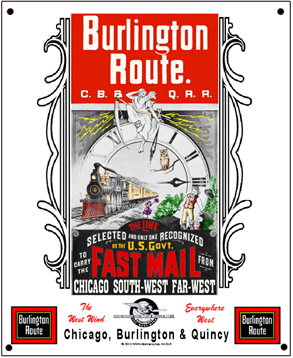 Nostalgic scene of the Burlington's Fast Mail Poster celebrating the US Governments approval of their fast mail trains. Tin sign of scene taken in Galesburg IL in the mid-60's showing oldest steam locomotives through Zephyr to the then newest GP30 diesel. 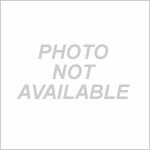 Photo was promoted as the Parade of Progress by the Burlington. 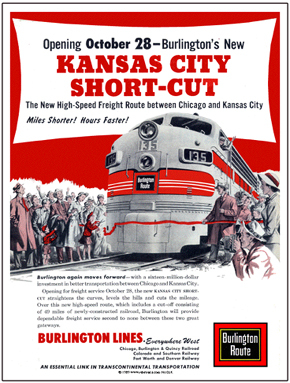 Nostalgic scene of a 1952 Burlington Route ad touting its new Kansas City Short Cut from Chicago. 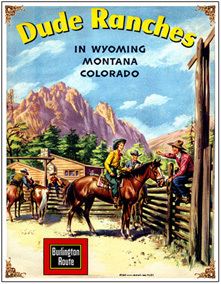 Interesting to note the references to the Colorado & Southern Rwy and the Fort Worth & Denver Rwy in the ad, both owned by the CB&Q. Beautiful scene of the Night Zephyr rolling out of the city and on to the plains. Nostalgic scene of a woman checking her makeup in the shiney side of a Burlington Zephyr before it leaves the station. 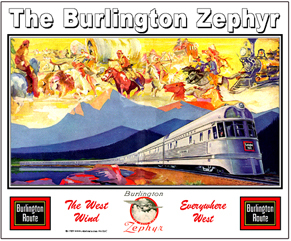 Featuring the beautiful Burlington Zephyr in a Western America scene with old west images in the sky. 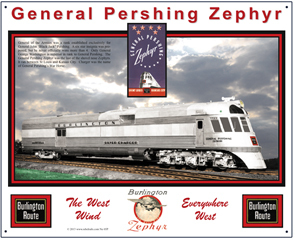 The General Pershing Zephyr was a salute to our Nations only six star General... only George Washington out ranks General Pershing. Six stars were authorized, but the General never wore more than four. This was the last of the shovel nose Zephyrs. 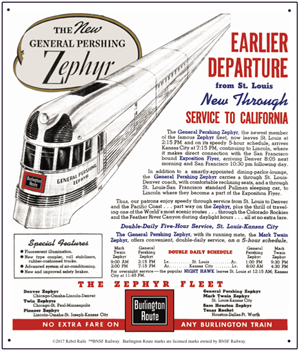 Reproduction of an advertisement ran by the CB&Q Railroad promoting its new General Pershing Zephyr passenger train. The Old West clashes with the New West, with the new Silver Streak Zephyr rolling along steel rails where once Indian Trails existed. 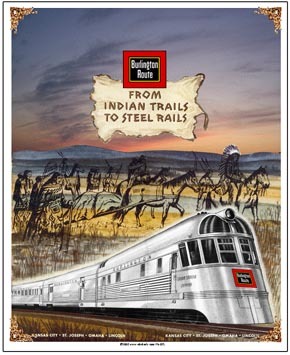 Ghost Indians are behind the shiny new Silver Streak Zephyr between Kansas City, St. Joseph, Omaha and Lincoln. 6 inch x 6 inch square tin logo sign of the Twin Zephyrs passenger trains used by the Chicago Burlington & Quincy Railroad. 6 inch x 6 inch square tin Zephrus logo sign of the Chicago Burlington & Quincy Railroad. Zephrus was the GOD of the West Wind.